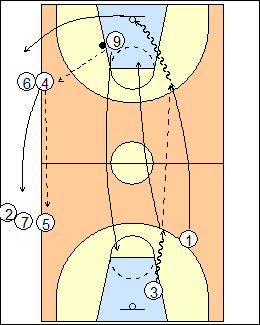 Two balls, 1 self-rebounds and outlets to 2, who headmans to 3, 1 sprints the floor for a layup, 2 follows his pass, 3 rebounds. 9 starts next, while 1 keeps going for a fullcourt pass and layup, 3 will rebound, outlet, and be the next shooter, 1 goes to the outlet line. Go for two minutes, keep raising the bar. 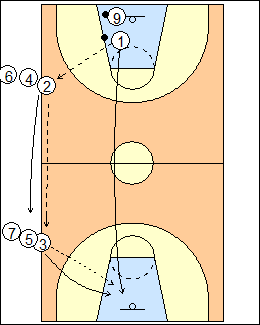 See Layups - Pass and dog, Fast break - Post sprint, Air it out.